Nuts have been given such a bad rap for their high fat content. The truth is raw nuts do contain a heart healthy fat and are packed full of protein. Pecans are high in plant sterols which can aide in the prevention of heart disease. Plant sterols have the ability to block your body from absorbing cholesterol lowering your LDL. When eaten in moderation pecans in particular are a great source of vitamins and minerals. 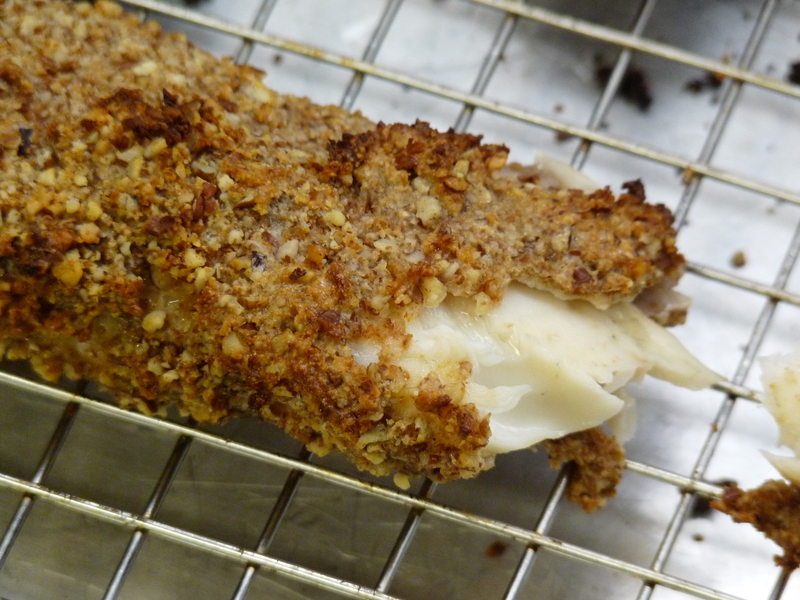 The family will go nuts over these hearty Pecan Crusted Fish Sticks. Coat a wire baking rack with nonstick cooking spray and place on a baking sheet or in a shallow baking pan. Cut fish into about 14 3″ by 1″ strips. Place pecans, bread pieces and salt in a food processor; pulse until fine. Place in a bowl or on a large plate. Put flour and eggs in separate bowls. Lightly coat cod in flour. Dip in egg and roll in pecan mixture. Put fish on rack; coat with cooking spray. Bake for 10 – 12 minutes or until golden. – The eggs may be replaced with milk or water. – Swap the flour for ground flaxseed meal. This month’s website review is on one of my three favorite craft sites: Root and Wings. I came across the site last year when I was looking for a book my sister-n-law recommended on the importance of family traditions. I am not sure if this website is related to the book Roots and Wings. I did find that the sister’s who own the site Roots and Wings have a passion for the Holiday’s and the traditions surrounding them. “Parents must give their children two things: roots and wings. Give them roots to keep them grounded through tough times. Give them wings to soar above everything, explore new worlds and fly farther than we ever did.” (Helen Bateman) Traditions are the roots that hold the family together. When our children feel safe they feel secure and confident. Their wings of imagination and creativity will let them soar to discover new things and share those ideas with their children someday. Erika, Rebecca, Anjeanette and Katrina hope to help families establish the roots to grow from, and wings to soar with by sharing their ideas for fun traditions, stories and crafts. 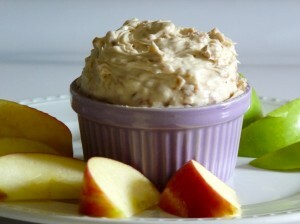 Caramel apple dip was once one of my favorite sweet guilty pleasures. It was all the rave in my circle of friends. If there was a baby shower, birthday party or get together you can bet caramel apple dip was on the table. I have not had caramel apple dip for years now and thought it would make a lovely appetizer or after school snack using the delicious apple just coming in season. Mix the cream cheese, sugars and vanilla until smooth. Stir in toffee bits. Refrigerate until ready to serve. Serve with a variety of sliced apples.